While in all custom houses you have the ability to use teleporters to move from floor to floor, there is still nothing for a more authentic house feel than the good old staircase. Not only that, they can be made to look really fantastic and add interest to any home. They are fun to build and there are heaps of variations in materials and deco etc that can make each staircase an individual masterpiece!. I take no credit for the following ‘step by step’ as the original instructions were posted on the Stratics UO Homes & Castles Forum. Desperado, has credit for the platform stairs, and I am not sure who first posted the spirals. Other ideas are all basically using the same premise. However, no deco site is complete without this so, here we go! 1. Decide where you want your stairs, and allow at least one tile behind for a landing on the top floor. Place teleporters as shown. 2. 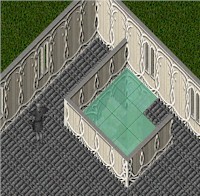 Place 3 staircases as shown over the teleporters with the front of stairs on the ground tiles. 3. Using the “visibility tool” click twice to see the flooring. The pic shows the first click, note the stairs start to become transparent. After the second click, the stairs will disappear and you will be at the floor view. 4. Using the ‘erase’ tool, erase the teleporters. 5. Now click on the ‘Go to 1st Story’ view, as shown. 6. The back portion of the stairs will disappear, leaving the front row. 7. Next place teleporters as shown behind the single row of steps visible. 8. Place a staircase with the front of stairs n the ground tile. 9. As per steps 3/4/5 erase the teleporters from under the stairs to leave the front portion as shown. 10. Next place your three staircases to reach your landing. 11. Using the erase tool, erase the piece of stair you positioned in steps 8 & 9. 12. This will remove the front portion of the staircases placed in step 10 as shown. 13. Now place teleporters between the two sets of stairs. 14. Place two staircases with the front to the west ground tiles. 15. As per steps 3/4/5 remove the teleporters to leave the front west section of the staircase. 16. As per step 14, place staircases for the east set with the front on the ground tile. 17. As per steps 3/4/5 remove the teleporters to leave the front east section of the staircase. 18. You now have the basis of your three way stair platform. Using 6 gozas in any color you prefer to match your deco, place on the tiles inside the platform, and raise each 4 times with the deco tool. Your stairs are now ready to climb. The same staircase with columns added to the base section, new tile-set for the floors, and the upper floor showing the view to ground. Remember with altered stairs the amount of tiles unable to be built on are going to take up larger floor area on the floor above than a regular staircase. 1. Decide where you want your stairs, and allow at least two tiles to the western edge before constructing. 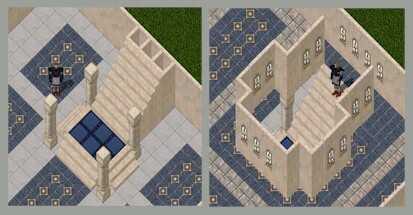 Spiral stairs may go anywhere as long as the west edge has two tiles free and the east edge one. Place teleporters as shown. 2. Place your first staircase with the front on the cream tile, as shown. 3. Using the step in 3/4/5 above, use the visibility tool to remove the teleporters, leaving the first part of the steps in place. 4. Place two teleporters as shown. 5. Place staircase as shown. 6. Delete the teleporters as per 3 above. Leaving the first two sections of the staircase. 7. Delete the front portion of the stairs as shown which were formed in steps 2/3. 8. This will leave the second part of the staircase. 9. Place three teleporters as shown. 10. Place staircase with the front of stair on ground tile. 11. Erase the teleporters from under the staircase as per 3 above. 12. Place five teleporters as shown in the picture, one either side for dk grey tile and three down the edge. 13. Place a staircase with the front tile on the flooring in front of the teleporter. 14. Erase the teleporters from under the staircase as per 3 above. 15. Place a staircase as shown. 16. Again delete the teleporters from under the staircase, leaving two sections of stair. 17. Delete the front step as created in 13/14. This will remove the front of the step placed in 15/16. 18. View of what you should have at this point. 19. Using the ‘visibility tool’ click twice to obtain ‘floor level’ and place five teleporters along the back corner as shown. 20. Place staircase on western wall. 21. Erase the teleporters from under the stairs, leaving the first part of the step. 22. Place staircase on the northern wall, with the front in the corner. 23. Again, using the visibility tool, delete the two teleporters remaining under the stairs. 24. View of what you should have at this point. 25. Delete the front of the step created in 20/21, which will take out the front piece left in 22/23. 26. Your staircase is now ‘technically’ complete. 27. Tidy up by replacing the floor tiles with your chosen tile. 28. So you don’t ‘fall’ off your stairs, add a ‘back’ wall, a half side wall, and corner pieces at the front and center, as shown. 29. On the floor above, place flooring and remove the illegal tiles above stairs, ensure your floor looks like the picture, as while some tiles are legal you need them removed so that a person climbing the staircase has headroom. 30. Using circle of transparency, place gozas and raise them until the edge of the goza is clear and you can walk up the staircase. 31. Added modification (optional) is to place walls around the stairwell and an arch. 32. Added modification, if you place a goza in the center and lift you may place plants, lights, single tile deeds, such as the suit of armor shown, or other decorations as you like. 33. Using a half wall around allows you to put a ‘row’ of plants which may look nice. In this case there is one rose of trinsic, as the test center didn’t have 3 dark blue campions to use! Don’t forget to use some type of wall above to stop you falling down the hole!